When we walked up to the restaurant it was already dark but I could tell that the exterior was new and fresh and when I peered through the windows I got nervous because it was packed. We entered the lobby area and were greeted by a super warm and friendly smile and were seated immediately. I immediately gathered that the clientele was what you would expect from the area, upper middle class to upper class, older men in business suits as well as wealthy wives dining without their men. I tensed up because I thought “what if my son disturbs these people? However the contrast between the clientele and the staff is obvious. The staff was on the ball but relaxed and happy. We were almost immediately approached for our drink order. I did peruse the menu online in preparation for brining my son to the restaurant. 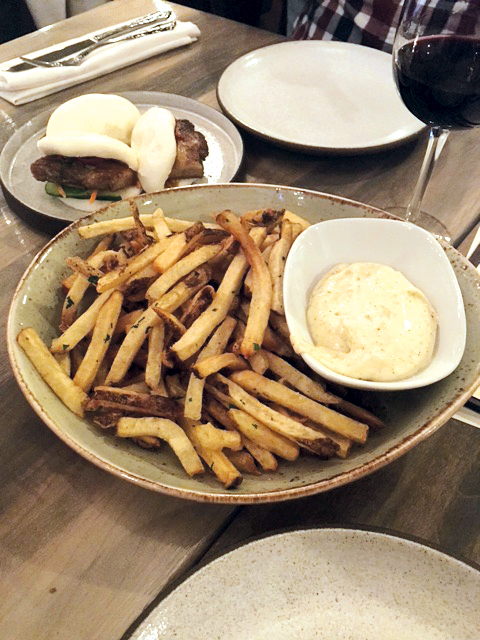 So I ordered the House Made Fries – Duck Fat, Fresh Herbs, Sea Salt, and Black Pepper Aioli. What kid doesn’t like fries? My husband ordered a glass of wine and I ordered an iced tea as I contemplated ordering a JM 9-24 – Johnnie Walker Black Label, Chambord, Fresh Blackberries, Ginger. I am always gun shy with cocktails because I often like the ingredients but I don’t like the way they blend together. The décor in the dining area is fresh, modern clean and minimalist with a hint of French provincial style. Some appealing accents are the grey topped tables and mini chandeliers. The bar area was a bit more rustic with modern pub appeal and French Accents like the antique mirrored wall. When our fries arrived it was a nice portion and they did not disappoint. My kid gobbled them up so fast we were about to order seconds. Honestly I probably ate half the portion but I am a sucker for duck fat. It was at this point that my belly had enough fat and carbs in it to compensate for the JM 9-24 so I ordered it. My cocktail arrived and I was impressed by my artisanal block ice cube. I sipped and was smiling much to my husband’s surprise. He never dissuades me from ordering a drink and it is probably because he knows he is going to have to drink it himself. It warmed my insides nicely, was not burning my esophagus, not too sweet, just the way I like a cocktail. Next we ordered our meal. We decided to go with small plates so we could try different things. For starters we went with. 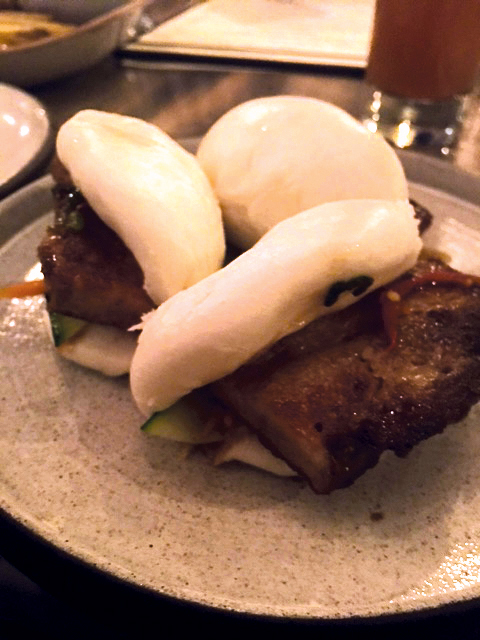 Korean BBQ Pork Bun – Pork Belly, Pickled Carrots, Cucumber, Mint. Then, Bibb Salad – Grapes, Bacon, Stilton, Buttermilk Dressing, and two “main dishes” House Made Ricotta Gnocchi – Wild Mushrooms, Tomato Confit, Black Truffles, Brown Butter, Aged Provolone and “Gyro” – House made Lamb Sausage, Pickled Onion, Tomato Jam, Spicy Feta, Yogurt. Let me just say I could have stopped at the Korean BBQ Pork Bun and been content forever. I actually wish someone would make me these to eat on a daily basis. The dim-sum style fluffy bun with a generous slab of tender pork belly mixed with pickled veggies and mint are a perfect combination. Three buns per order and I really did not want to share the last one with my husband, but you know how it goes. Next was the bib salad it was super fresh and I was able to sell the salad to my husband because it has cheese and bacon on it. The house made ricotta gnocchi was another star. 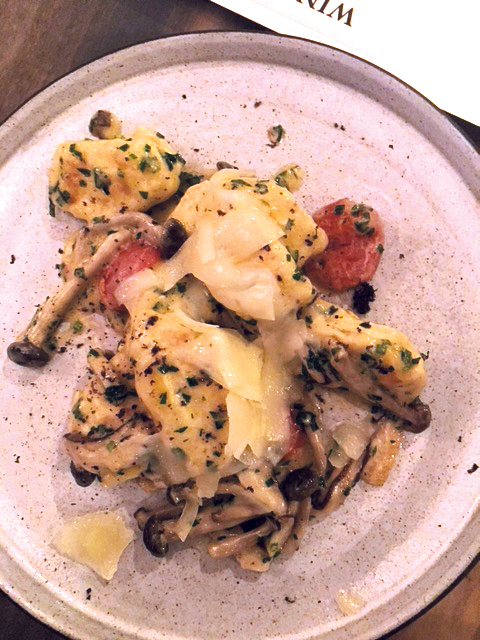 The chewiness of the gnocchi with the creamy sauce and wild mushrooms and salty provolone melted in my mouth. The “gyro” was a hit as well, it was exactly what you would imagine, the gyro flavor without all of the mess. I can never leave a restaurant without dessert. My husband knows this, he is not a dessert person but I don’t care I make him wait an additional 20 minutes per restaurant because you know…chocolate. There was an array of desserts that were recited by our super sweet server. I almost went with what the server described as a deconstructed S’mores. However I decided to keep it simple, giant warm chocolate chunk cookies with a glass of coffee milk. This was a delightful end to a great meal. I could not finish the cookies so I took them home and ate them for breakfast on Saturday morning and they were still just as delicious. 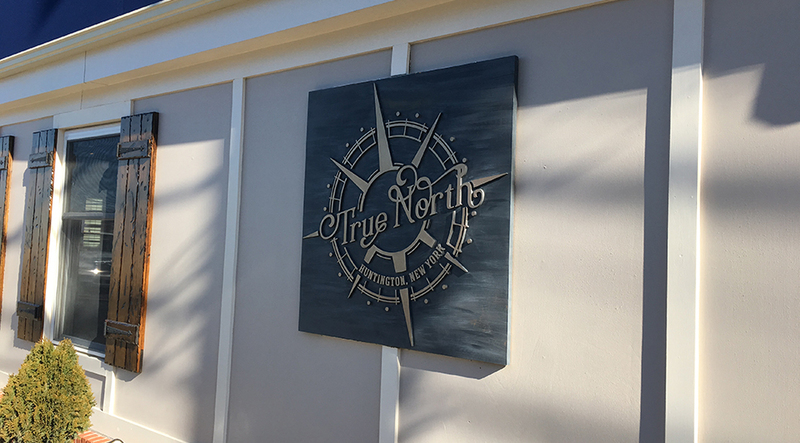 If you want an excellent dining experience which offers an array fresh and interesting options, a relaxed atmosphere and truly amazing staff True North is definitely worth the trip. We plan on returning with or without child, most likely not in Long Island rush hour traffic to try more exciting food and drink.